To put it simply: I adored this book. As soon as I read the synopsis I knew I would learn about a forgotten chapter in history. What I didn't know was that I would fall for the tale and the characters. Baker-Kline has crafted a wonderful novel involving not only the orphan trains of the late 1800s but also the foster care system of today. Orphan Train is a commentary on what happens to children without parents (or parents that are unable to care for their children) and a deeply moving story. The book moves seamlessly from Vivian's early life to Molly's current situation. Baker-Kline has done a faultless job of blending historical and modern elements. In my opinion that rarely happens in a book encompassing both historical and modern elements. Orphan Train is an emotional and beautiful story that I highly recommend. I'm fascinated by the orphan train thing! I hadn't heard much about it until recently- it was in the backstory for one of the characters in Swamplandia! This sounds good! There was a mention of the orphan trains in a recent book I read. (After Visiting Friends...I think?) I knew that Orphan Train was coming up on my tbr pile and I got that little zing of YAY! I love when that happens. I can almost guarantee that I'll see references to orphan trains here and there now. ;) I'm kind of babbling here but I think you'll know what I'm trying to say! I agree - it's so hard to equally write modern and historical storylines. I've read about the orphan trains before. It's such a fascinating (and sad) part of history. Usually I'm racing to get back to the historical parts of the book. I was pleasantly surprised when it didn't happen to me this time! I'd like to find a good nonfiction work about the orphan trains. I'm fascinated by it now. Sounds really good! On the wishlist it goes. Fascinating bit of history I have never heard about before. Looks like a book I'd enjoy reading. Oh I will read this one! Anything that opens a piece of history through fiction is bound to be useful, if not a wonderful story. All of the history I know well has come from historical fiction. Ah yes, the aging out of the foster system element, true! That is what has happened to me with this book :) It's a great read, I hope you'll read it! The Chaperone also features orphan trains. I will try to get to this at some point. I think Jen and I were considering it for BOOK CLUB, but then went for a summer mystery series since we usually go a bit lighter in the summer. This would be a good book for BOOK CLUB, plenty to discuss. :) I understand going with something a bit cheerier in the summer though! I really want to read this. Thanks for reviewing it! I had never heard of orphan trains until I read The Chaperone, which is also fantastic. I'm going to have to look into this, it sounds great! Thanks for the review - I have seen the book around but wasn't sure what it was about. It sounds great! Oh great. There you go. Adding another book to my list to read. ;) just kidding, I LOVE DOING THAT. Muahahahahahaha! I'm evil and I looove it. ;) I do hope you get to this one Heather! I've been waiting for your review of this! It's going on my TBR list immediately. You've made this sound wonderful! I can't wait to read it! I'm so glad to hear that :) I hope you enjoy it as much as I did! I also loved this book!!! My review comes out next week! LOL, it happens to all of us :) The weeks zoom by! I'm glad you liked this one too, can't wait to read your review! Glad you liked this one so much! It's on my Nook and ready to roll for my next book club meeting. I read a couple of pages last night and it's already engaging! I loved this book, too! Great review!!! Thanks Kristin! :D It's a good one! I adored this book as well. I listened to it and it was a wonderful audio production. I had heard of orphan trains but to hear a story like this really makes you think of how hard life was for these helpless kids. It broke my heart. I would really like to know even more about the orphan trains. I'm hoping to bump into a nonfiction account at some point. It is heartbreaking isn't it? :( Thanks so much for visiting Darlene! I enjoyed Orphan Train as well. Nice review. Thanks so much :) I'm glad that you liked it! I'd never heard of the orphan trains before (although someone above said they're mentioned in Swamplandia, so I must have just forgotten? ), and they seem like such a sad part of our history. This sounds like a really lovely, moving book! Great book and great review. 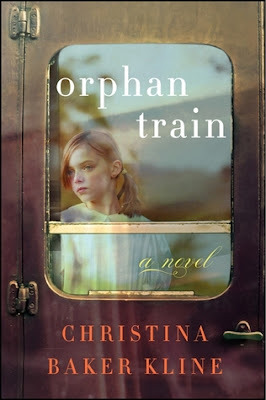 I loved this book, too and it made me want to learn more about orphan trains! I could not put it down! I would definitely read more by this author! Here's my review of Orphan Train! Great review! I loved this book- I had never heard of the orphan trains before either-and I majored in history (blush). Such a well written book.